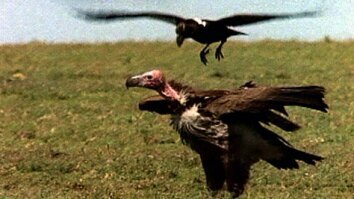 October 15, 2015 - Would you care if vultures were dying because of a man-made drug? Meet a man in Spain who really cares about vultures—so much so that he travels great distances and climbs rocks to feed them. The majority of Europe's vultures live in Spain, and these vultures are in danger of being decimated, following the country's legalization in March 2013 of two products that contain the drug diclofenac, which is used as an anti-inflammatory and painkiller in cows and other livestock. The drug is blamed for killing upwards of 99 percent of vultures in India in a single decade. 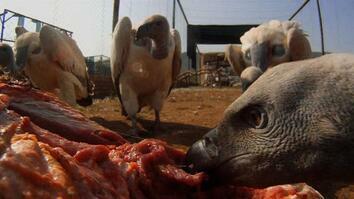 Vultures play an important ecological role in disposing of dead animals. And they die within a few days after eating the carcass of an animal recently given diclofenac. You leave the dead body of an animal on the ground. Vultures come and eat it. A bearded vulture comes and takes the bones. Nothing remains. It's the most natural thing in the world. bones, and other remains taken from a slaughterhouse. Everything is reviewed by a veterinarian. This food is not suitable for people. the feeder of the Fondo Amigos del Buitre. showed me vultures for the first time. That moment is recorded in my mind. Since then, they've been my whole life. I was ten, and they were taller than I was. I thought they would be small—like this. I didn't think they'd be such big things. I've been with them every day of my life. 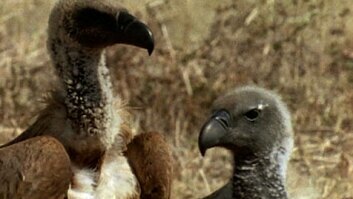 between 95% and 99% of three species of vultures disappeared. Diclofenac is given to animals in pain—with a limp, for example. it provokes the immediate death of the vultures. which is in the Cañones y Sierra de Guara Natural Park. Dolofenac and Diclovet. Both of them contain diclofenac. as 95% of the European vulture community lives in Spain. indicate an annual range of mortality of between 600 and 6,000 individuals. they associate it with food. They trust the red jacket. Where is Pinto? I can't see him. Let go of the bag, let go of the bag! You eat a lot, dude! Canella didn't eat so much. We have to recognize that it is a unique species. It only exists in this peninsula. it's because it has been reintroduced. This is the Eurasian griffon. It's a natural treasure—a jewel—we have in the Iberian Peninsula. If vultures disappeared, I'd like to disappear with them.